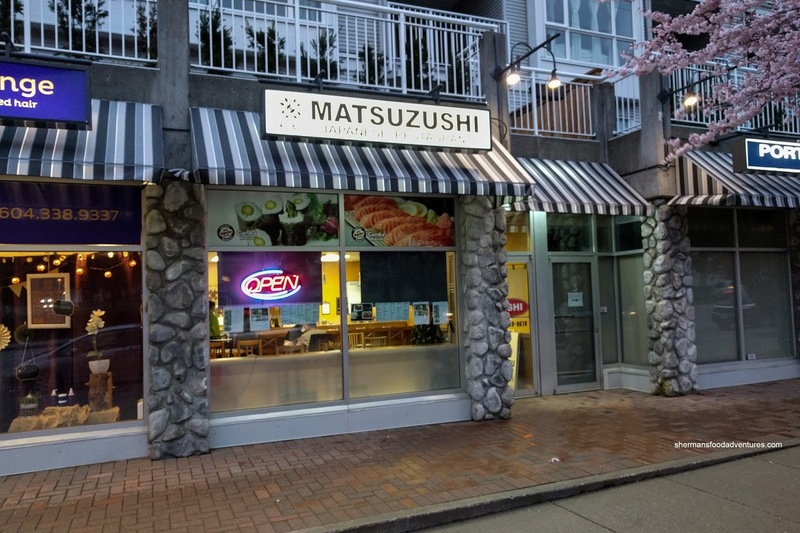 Generally, it is pretty easy to get a cheap Japanese meal in Vancity. 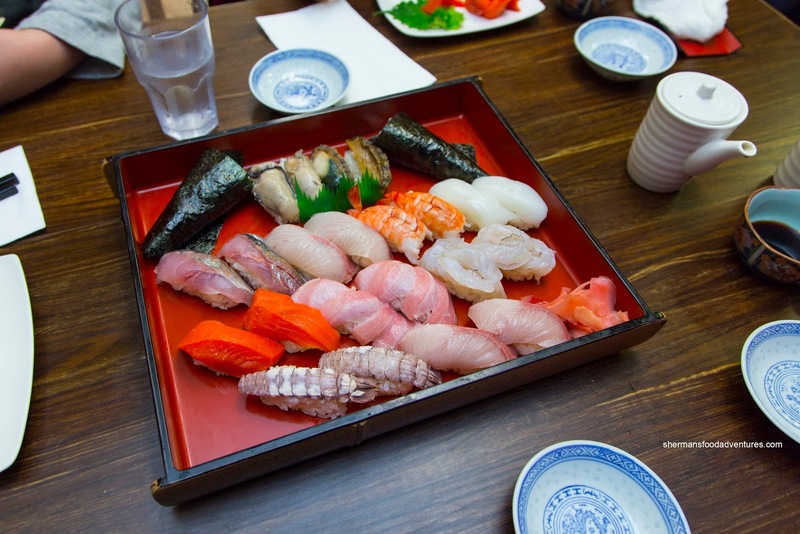 There are so many "value" spots that serve up big portions and oversized slices of sashimi, one could fill up for less than $10.00 each. However, we all know this is not the optimum way to enjoy Japanese cuisine and in fact, it upsets many foodies. 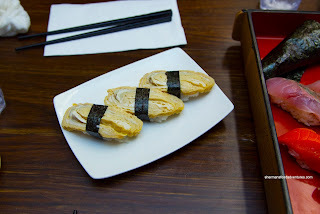 For me, there is a time and place for this type of "Japanese food" and I won't be a food snob against it. By the same token, I do enjoy the occasional authentic experience. Now that is not as easy to find and even harder is a place that is reasonably-priced. Well, there is such a place, but it resides in Port Moody. Great for those in the tri-cities area, but a little out-of-the-way for those Downtown dwellers (I used to be one). Suggested by Sharon, I visited the place with the $22.00 nigiri Omakase menu in mind. $22.00?!?!?! Yes, this is not typo. If you sit at the bar, you will be served piece-by-piece a la Maumi-style. We sat at a table and received everything at once including mantis shrimp, hamachi, prawn, toro, salmon, ika, ebi, kanpachi, aji, abalone, oyster and negitoro cone. Without going into too much detail, the sushi rice was on point being chewy and mildly-seasoned. 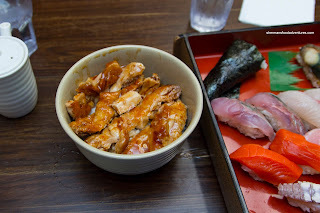 Other than the mantis shrimp, all of the fish and seafood was sweet and appealingly textured including the buttery and bright hamachi. 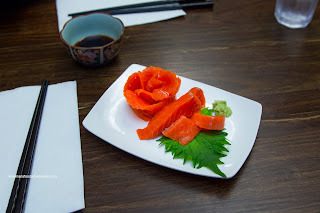 For my daughter, she was content with an order of the Sockeye Salmon Sashimi. With a few pieces on one side and a flower design on the other, this was no different than the one we had in our Omakase. Hence, it was sweet and tender with a firm resistance when eaten. Simple plate of food, but good due to the fish quality. My son doesn't eat raw fish, but gladly downs Tamago Nigiri like a champ. These were house made where it was soft and not dense (like the value premade versions found at non-authentic Japanese restaurants) while lightly sweet. Combined with the chewy sushi rice, this was good. Of course he couldn't dine on tamago only, so we got him a Chicken Teriyaki Donburi. Loved the simplicity of the dish as there wasn't senseless sprouts or other veggies. Rather, it was plenty of tender chicken atop chewy rice. The sauce was not overwhelmingly sweet nor salty where there just enough of it. Only downside was the chicken skin as it was flabby and fatty. This was the only thing we didn't like about our meal which means it was pretty solid. Considering the reasonable pricing for the quality of food, this is a place where you can visit often without breaking the bank.